1) Access to healthcare - One of the biggest challenges facing the ACS is the surgeon shortage, Eastman says. The Association of American Medical Colleges estimates that there will be a shortage of 63,000 doctors by 2015 and 130,600 by 2025. As Eastman says, "without access, there is no quality." 2) Rural surgery - Eastman grew up in a small town in Wyoming, so he understands better than most the problems rural communities face in getting quality healthcare. 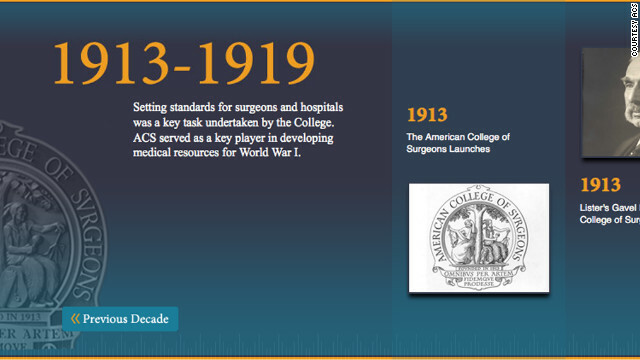 He plans to encourage the incoming class of ACS fellows to pursue practices in areas that need surgeons the most. 3) Surgical education - "Young surgeons coming in have an increased interest in a balanced lifestyle," Eastman says. Combine fewer hours in the operating room with increasingly complicated technology, and "we really need to look at how we're training our new surgeons." 4) A global approach - "I think the issues we are facing, like access or rural surgery or surgical training and education, are really international problems," Eastman says. "I think we all have something to learn from one another." Surgeons have to both fearless and cautious. They do some of the most difficult things in medicine and rightly are considered the aristocrats of medicine. The biggest problem facing them is that our society demands perfection but no one can always be perfect. So hopefully they will lead medicine into solving the pressing problems of medicine for all. Thank you for all of your efforts, an American who wishes you the best. This history is important but sadly most people won't even click on this story today. I did, because a few years ago I broke my ankle and had screws put in, and since I've read quite a bit about the history of medicine I know for a fact that if I had fallen 100 years ago, the best I could've hoped for would be a permanent major limp and the worst, amputation or even death by gangrene. My hospital is 2 miles away from me and until that day I took it and the docs there for granted. No more! As someone considering going into the medical field, I just had to take a look. Surgery has come a long way, which is good. But, and I know others will disagree, I wish they'd toss bariatric surgery. The idea of basically mutilating a perfectly healthy organ to fit an unnatural ideal (for most ppl) just leaves me cold. If you think bariatric surgery leaves you cold, don't ever look into cosmetic and asthetic surgery, which truly mutilates (your word) a perfectly good organ to fit an unnatural ideal. Bariatric surgery effectively treats obesity with its known associated co-morbidities (hypertension, diabetes/glucose intolerance, arthritis, sleep apnea to name a few). The surgery is frought with risks and complications, but for some, it is a life changer. One of the greatest surgeons was Dr. William Stewart Halsted (1852-1922) who helped found John Hopkins Medical Center. Amazing he was a morphine addict while being the Chief of Surgery at John Hopkins. Halsted was famous for being so calm in surgery that nothing rattled him, few knew that he used morphine for most of his life. The world is certainly a strange place and few would have guessed that a morphine addict was doing surgery for so many years. Most of the trouble with drugs like morphine is the government's attempt to control their use and failing to do so. Illegal morphine may be impure, it is not sterile, and the dose is a matter of guessing. Dr. Halsted had access to pure morphine and he knew what he was doing. Surgery wouldn't progress if anesthesia hadn't progressed too. The two go hand in hand! Many sugeons are still fairly primitive. I had one screw up surgery on me and then had three other surgeons afterwards tell me that the guy did it wrong. You really need to be careful who you let operate on you. You only have one body and many doctors, especially young ones, are much more concerned only that you can pay your bill and where they're going on vacation next week than they are about your life.